Had a blast hosting two “coaching” session for Patreon about how to podcast. I hope they were informative for folks attending too. Patreon gave me this nice little badge to display as well. 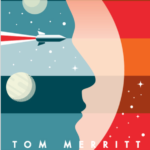 Saturday March 18 at 4 PM, Tom will be at Book Soup to talk about his book Pilot X and sign some copies. Whether you’re interested in the book or Tom’s podcasts, you’re welcome to come on by! And again the event is Saturday, March 18 at 4 PM. This coming weekend Sept. 23-25 is the Los Angeles Podcast Festival, AKA LA Podfest. For the second year they have been kind enough to ask me along to moderate a panel. Content Evolution: The changing content of podcasts will feature Dave Anthony (The Dollop), Gus Sorola (Rooster Teeth) and Shawn Marek (Sideshow Network). 4 PM Sunday in a ROOM called Santa Monica not in the city. The LA Podfest is in the Beverly Sofitel 8555 Beverly Blvd, Los Angeles, CA 90048. Hey folks I’ll be in town for a couple days during the SXSW Interactive festival. with: Jamie Tardy, Eventual Millionaire, Kerri Hoffman PRX, hosted by Ryan Williams, Influencer Economy. Hey folks, I’m excited to be heading back to DragonCon in Atlanta on Labor Day weekend. This year there will be live Daily Tech News Show, Sword and Laser, FSL Tonight, and I’ll be jumping in on Justin and Ashley’s podcast wedding and Night Attack as well as a few other panels! If you’re going to be at DragonCon I hope you can swing by at least one of the events and say hello! Here’s the schedule. Description: A few top authors—who are also skeptics—discuss what effect their personal skepticism has on their writings. Description: Live DTNS with Tom Merritt, Veronica Belmont, Justin Robert Young and Jonathan Strickland. Illustrations by Len Peralta. Description: Get the coverage of the big finale between the Coruscant Senators and Skaro Exterminators right after the game. Find out the champion and what teams will be elevated into the league next season! Description: What else is out there besides Facebook? How to generate “buzz” about a book to promote sales. Description: Belmont & Merritt’s podcast on all things sci-fi and fantasy with author Cherie Priest. Description: Justin Robert Young & Ashley Paramore get married with super-special guests! Description: Skeptical thinking isn’t always about Bigfeet, ghosts, & tarot…Sometimes it can be in your tech, too! 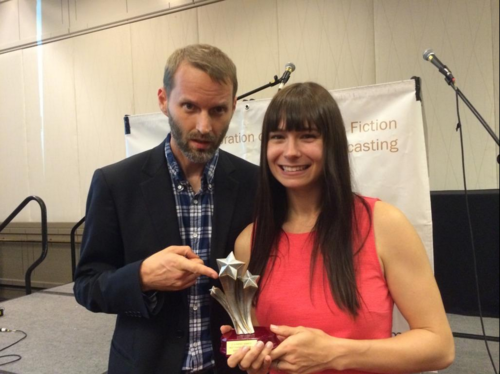 Description: Tom and Veronica host the Parsec Awards for Sci-fi & Fantasy Original Content and Speculative Fiction. Come see Tom at DragonCon 2014! Hey folks, if you’re in Atlanta or headed there for DragonCon at the end of the month there’ll be plenty of chances to say hi! I’ve got loads of panels and shows happening. Here’s the schedule. Title: Podcasting Track Kick Off! Description: Join some of your favorite podcasters as we take the temperature of the Podcasting world, and talk about some our best moments of the past year. Description: Join veteran podcasters for a frank conversation on making money w/ podcasting.Covering topics: sponsorships, affiliates & respecting your audience. Description: The season finale of the premier fantasy sports league. Reports on fantasy & science fiction franchises. Description: An irreverent fun-fest featuring unusual friends, bizarre games and more! Description: Veronica Belmont and Tom Merritt bring their podcast about all things Sci-Fi and Fantasy back to Dragon*Con with a special guest. 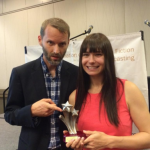 Description: A Celebration of Speculative Fiction Podcasting. Awards are given in several categories ranging from content to audio quality. Ladies and gentlemen, for the first time in two years I will be coming back to the land of the bridge bats and the home of the Shiner Bock. Thanks to the siren song of Diamond Club TV I will be attending the Diamond Club shindig on Saturday. You must join me! And together we can rule Texas! Shut up and give you details? Here goes! WHAT: Brian Brushoowd, Justin Robert Young, Veronica Belmont, MAYBE Andrew Mayne, and myself hanging out chatting with chatters, and pretending to be the Rat Pick circa 1967. MUSICAL GUESTS: The inimitable Tay Allen and Possum Posse. In just a month I’ll be winging my way to Atlanta once again for Dragon*Con! This year my schedule has been spread out lightly like butter across the four days. If you’re going to be at the Con, here’s where you can find me if you’d like to say hey. Tom Merritt discusses what it takes to keep up with the ever-changing tech news industry, and how they keep the hit podcast, ‘Tech News Today’ running. Justin Robert Young and myself will bring you the post-game wrap-up from the FSL championship. Vulcan vs. Lannisport? Coruscant vs. Rivendell? Whatever it ends up being, we’ll be there, with special guests. Brian Brushwood, myself and some other guests will discuss how public perceptions of science and scams and irrational and mistaken beliefs affect the ability to explain the world in news and entertainment. Meet some of the minds behind Geek & Sundry including The Guild and Sword & Laser! Come say hi at Comic-Con! So I started planning to go to San Diego Comic-Con when TWiT decided not to cover it live. I thought, “Hey, I’ll just go and cover a few panels, walk the floor, have a good time. easy.” Then Geek and Sundry decided to add Sword and Laser to its lineup, which rocks, and I thought, well there’ll be some G&S stuff to do for sure, so that’s good. Then I decided to schedule a TWiT special on bandwidth caps, because that is an issue that need some explaining. And so why not schedule it during Comic-Con. Amiright? So all of that is a long way of saying, I have a crazy schedule at Comic-Con this year, and here it is. 10 AM – Tech News Today live from the San Francisco airport. Any tips on where to get good bandwidth? Turns out Virgin America doesn’t open their lounge until 12:30. /me shakes fist. 9 AM Bandwidth caps special with Dane Jasper (Sonic.net), Benoit Felten (Analyst), Reid Fishler (HE backbone provider), Chris Mitchell (Muninetworks.org) – Skyping from San Diego, live on TWiT. 10 AM – Tech News Today – Me live from San Diego in my hotel room, other hosts in Petaluma. So if you’re going to be in San Diego fro Comic-Con, come on out and say hi!! BayCon, the San Francisco Bay Area science fiction and fantasy convention is happening Friday, May 25 to Monday, May 28 2012 at the Hyatt Regency Santa Clara. My Sword and Laser co-host Veronica Belmont is speaking on practically every panel!! I think she’s only outdone by star convention guest Brandon Sanderson. Of course Veronica got me to head down there too and we’re doing a Sword and Laser panel!! So come on Bay Area SFF fans, head down to Santa Clara. The Sword and Laser panel is Saturday from 5:30 PM to 7:00 PM in Central. I assume “Central” is the name of a ballroom. But it *might* be Central Command or something which would rock.